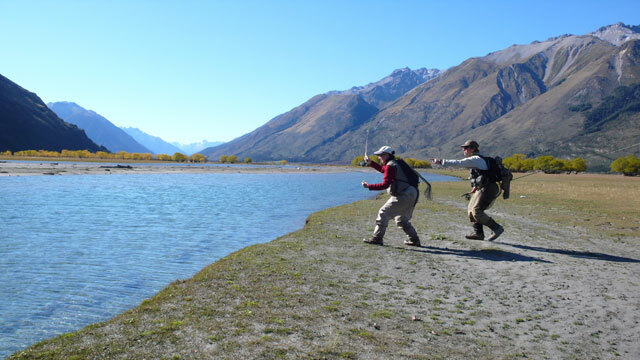 The Southern Lakes of New Zealand always surprise no matter how often you fish them. Maybe it’s their sheer volume and depth that assure we never quite plumb all their secrets, or perhaps the angling discoveries have to be made one at a time, drip-feeding the lifetime of passion. I have lived and fished here for over a decade and a half and I can’t say I really know fishing at the lakes. I do know fragments – some of them quite well – the early-spring nymphing, the manuka beetle bonanza, the cicada time when big browns patrol the surface of the deep-green water like something out of Jaws and when a well-tied Yellow Humpy can yield two dozen fish before it starts to unravel. One thing I did learn about this picture that is the Southern Lakes fishing is that when a new fragment appears, getting to know it is going to be a treat. Without exceptions. The fish returned to its beat, unperturbed, while I untangled. Bad luck? Well, not if it happens four times in a row, on the same trout. Especially if, in identical circumstances, Craig hooked his two fish cleanly, during their first attack. It was clearly a matter of skills. There was finesse and fine-tuning required before those Volts and Amperes could travel up the fly line, into the rod handle and the hand, on to fire the entire nervous system, and make the heart glow. On another fish Craig showed us again. Cast well up and beyond the fish, mend upstream and hold the rod tip down to let the fly sink before it starts to swing. Then, as the fly approaches the fish, give the line a gentle tug. Rising the rod a few inches and pulling in the resultant slack is just enough. Watch the fish chase and take, this is what we’re here for after all. Then, ah, the secret of secrets, a test strip, because in their glutenous rush the trout can often miss the fly just as the inevitable drag whisks it away from in front of their snouts. In my own vocabulary, the test strip would be something a photographic lab would do in pre-digital days, though I guess the term could also refer to a job interview at certain types of night clubs. For Craig, it meant a subtle tightening of the fly line to feel if the fish actually took the fly. If it didn’t, the manoeuvre animated the smelt, adding urgency to its movement and a brutal take would often follow almost instantly. There are some 19 known species of galaxiid in New Zealand – giant kokopu, koaro, longjawed and flathead, banded and dwarf – but mercifully they can be all imitated with just one fly – the elegantly simple Silicone Smelt. Even on a long leader the Silicone Smelt casts like a dream and you can present it as accurately as you would a dry but the Smelt has one inherent problem you need to keep in mind. Especially on long casts the soft tapered tail has a tendency of catching on the hook and staying on the right angle to it. As you cast and retrieve it, such smelt becomes a veritable propeller putting on a fast-accumulating spin on the leader, making a real mess if you continue unaware. I have never caught a fish on such “crippled” smelt and it pays to check the fly every few casts. With a bit of experience you can actually hear if the smelt has gone crooked as you cast it. The sound is a light fluttering, not unlike when a dry fly picks up a tiny leaf. Not all smelt flies are made equal. The cheap round squirts may be okay for the broken water at the rip but fishing to a sighted trout you want unrefusable quality. Such smelts have flattened tails which, Craig insists, assure the all-important trout-triggering flutter when they swim cross-current. As the day unfolded we stalked the braids of the Hunter, the estuarine oxbows and channels cut into the valley floor flat like a football field. We hooked more fish and lost some too because the hooks of the Silicone Smelt are large and don’t always set well. This we did not mind, being connected to a charging fish even for a few moments was electrifying enough. The fish were good, averaging around five pounds in weight, and about as much in horsepower. There was only one thing which was ruining this otherwise perfect day: it was late afternoon and Georgie still did not have a fish. This was not through the lack of trying. 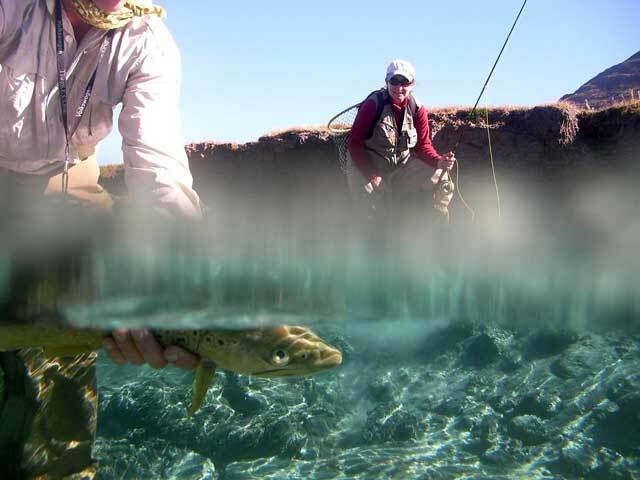 Her casting was letting her down a little, especially when a trout was in sight and the adrenalin surging. 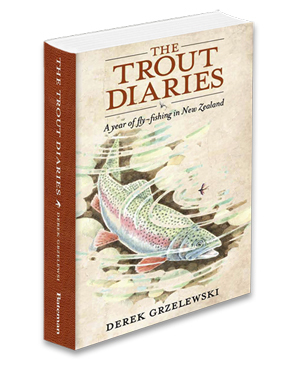 The fact that speed of delivery was critical – these trout were fast cruisers and you’d often have to run and cast to keep putting the fly in front of their noses – was not making it easy for her. But we worked on her casting, offering hints here and there, and saw that it was changing fast, straightening and getting longer, and more and more perfectly accurate, at least once the fish was spooked. But then it was too late. The sun had disappeared behind the mountains, and with polaroiding gone and the temperatures plummeting we had to beat a quick retreat for the boat and the open water. Minutes later, we were back in the sun, with the warmth and light streaming in through a deep V-shaped gap in the mountains, aligned like a gun sight with the mouth of the Dingle Burn. We parked the boat and ran toward the braided rips, wanting to make the most of the waning day. And a good thing we did. With two consecutive casts, and with the current straightening the line and helping her to feel the takes, Georgie hooked two fat rainbows, which – hats off gentlemen – proved to be the largest fish of the day. Both were silver torpedoes smudged with crimson and, as she was only using a # 5 rod, Georgie screamed and cursed in elegant Italian as her forearms were turning into jelly against the sheer pulling power of such magnificent trout. An hour later, we were at Craig’s place overlooking Lake Hawea, watching the expanse of water being swallowed by the dusk. The log fire raged quietly and sitting around it we sipped Glenfidditch, to celebrate the perfect day, to dispel the last of the chill from the journey back. In retrospective mood such moments bring about, I casually mentioned how amazing our lakes were, how, just when you thought you knew them well, you’d find something completely new that would both surprise and delight. “Well, actually, there is another thing you may want to try, not even many locals know about it …” Craig grinned from behind his glass. What was it? Another one of his secrets? I asked but he would not say. “Oh go on. Do tell Mr Smith,” Georgie insisted. “Well, in the spring …” he began, and smiled again. Georgie and I were all ears.